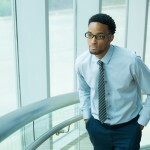 J. Luke Wood is the Co-Director of the Minority Male Community College Collaborative (M2C3). He is also an Associate Professor of Community College Leadership and Director of the doctoral program concentration in Community College Leadership at San Diego State University. Along with colleague Frank Harris III, Wood started M2C3 several years ago, to provide community colleges with support in building their capacity to better serve historically underrepresented and underserved men, particularly men of color. His research and practice agenda provides focuses on the men of color experience in the community college context. This focus is motivated by the fact that community colleges are the primary site in postsecondary education where men of color reside. Wood received his BA from California State University-Sacramento in 2005. There he also completed his MA in Higher Education Leadership in 2007. In 2010, he earned his PhD in Educational Leadership and Policy Studies at Arizona State University. Wood is the recipient of numerous awards, including the Barbara K. Townsend Award for Exemplary Emerging Scholarship, the NASPA-Men and Masculinities Knowledge Community Research Award and the Mildred Garcia Award for Exemplary Scholarship. Wood can be found on Twitter @jlukewod.